Aamir Liaquat left BOL News in a dramatic manner, bidding farewell to the channel on the 14th of August during Independence Day special transmission. While the news is still hot, BOL News has found a way to fill in the void created by his departure. There are a lot of rumors regarding his dash to the next TV channel. The matter has been discussed in detail which reveals the possible paths that the popular anchor person could have taken when he left BOL News. 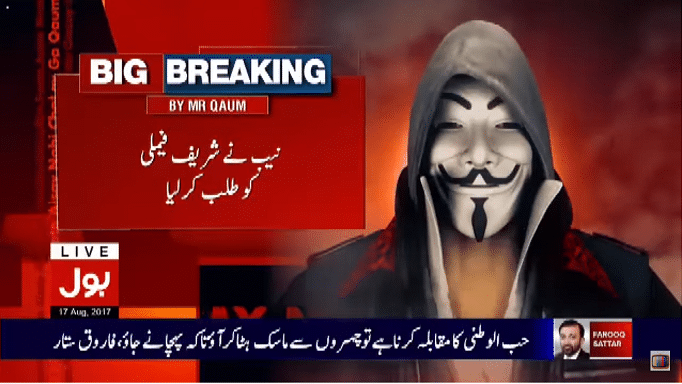 Well, BOL News has moved on and his replacement for the show ‘Aisay Nahi Chalay Ga’ is a character, wearing a Vendetta mask (often used in revolutions), called ‘Mister Qoum’. This is not the first time this character has been a part of this program instead of Aamir Liaquat. The last time he did it was when the famous host was banned by PEMRA. Having succeeded Aamir Liaquat, the program has been renamed to ‘Qoum K Sath Aisay Nahi Chalay Ga’. The question is, who is this character? Whose voice is being used? As far as the voiceover is concerned, its easy to discern the person through their accents. Mr Qoum sounds very much like Hamza Ali Abbasi, a popular actor and an anchor person at BOL. Another anchor from BOL, Talha Jatoi, might also have featured in the show. What do you think about BOL’s cover up move? Let us know in the comments section. Why you guys give such important to this person. Its just the anchor not more than that. And propakistani is treating him as a President of Pakistan. abdul wahab you are amazing person. I liked your comments. I think you are employ of propakistani. Phir pakistan ka Allah hafiz if jokers like him will be president. Now news channels will run like his? We were never a serious nation after 1947 and collectively we are liking such most silly things, reporters are no more reporters, they are self claimed saviors of the nation/crowd. What ever my boss says is correct alwayz. Seems publicity stunt by Aamir Liaquat and BOL. Amir Liaqat nay bhaut galat kiya hai BOL ko chor kar. It is Guy Fawkes from the failed revolution in London on the 5th of November, 1605. The voice is supposed to be computerized. It is so obvious that it’s Jatoi. Well, i think now a days, news shows sell on hot lies instead of proper news, tabsary krva lo bs.